Powerful universal processor core for "embedded control" applications. Usually plugged onto custom base boards with drivers, relays, connectors etc., that - by their low complexity nature - usually can be manufactured using standard bi-layer pcb technology. Combined with the pre-configured real time kernel this approach helps keeping time-to-market low. 128x8 I²C EEPROM for configuration data, I²C bus externally available. 53x53mm (~2x2 in.) module size. 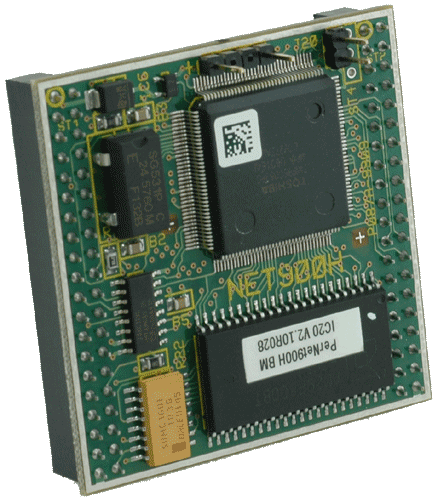 Fast-start set: Processor module seated onbasic function evaluation board NET900NT. Includes mCAT2 development pack, TLCS900-ANSI-C-Compiler/Assembler evaluation edition limited to 3000 lines of source code, RS232 cable to the PC and processor manual. Fast-start set as above but with full featured evaluation board (EVA900) instead of NET900NT, allows immediate use of process i/o, not only serial lines. NET/900H unites perfectly the essential hardware and software to control measuring equipment, machines, LCD terminals, climate control units, regulators etc. The many i/o functions, generous memory size and the modern real time kernel for C programming comply with all requirements even for demanding applications. The IUSC port can be used to network up to 250 NET/900H using the BITBUS fieldbus (being either master or slave). By using SDLC as its low level protocol, BITBUS offers secure communication even over distances of several kilometres. 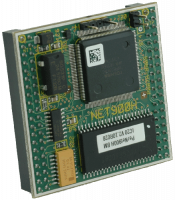 For the evaluation of the module ELZET80 offers a number of standard base boards (NET900NT, EVA900), but usually a custom board is used for the final application. While the NET/900H module is a 6-layer board with high density SMD assembly from both sides, such custom boards can be made fast and at minimum cost as they usually require a standard two-layer pcb only with through-hole component placement. While we like to do the custom board for you, we don't keep you from doing it yourself: All schematics and documentation that you might need for you own design work are available free of charge. Of the 80 module pins there are 38 i/o, 20 pins local bus for external i/o extension, 8 ports of the IUSC, further I²C bus and auxiliary signals like WAIT, NMI and of course 4 pins for the power supply. Three pins for the analog outputs are available on a separate conector. One pin is used as coding to prevent misalignment of module socket and header. The mCAT kernel makes it easy to start with software and to keep programming organized: programs can be downloaded to RAM or Flash-EPROM, a monitor allows viewing task states. A boot-loader in a protected flash block allows updating of the real time kernel itself. Our fast-start sets contain everything you need to write your "hello world" program on NET/900H (except the PC, of course).